This post has been sitting with a title for ages. 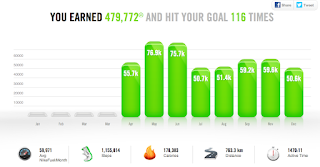 I was scared to write it as I am not exactly an athlete who needs sports tracking but hey I am joe public & this is my blog for my thoughts, so here goes a post about Nike Fuelband. Very aptly timed for all your new years resolutions to get healthy or lose weight. As a dietitian I have the nutrition know how to lose weight but I just can't resist a good gadget to help me on my way. In fact if you were to ask someone to describe me based on my gadgets/stuff they would probably think I was a gym bunny or health enthusiast. I am neither of these. I do however want to lose weight & many companies have put some good technology to use in helping you achieve your health goals. I am currently road testing a few. 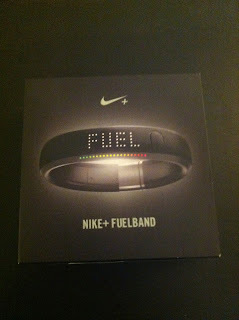 The first my Nike FuelBand. What is a Nike fuelband? 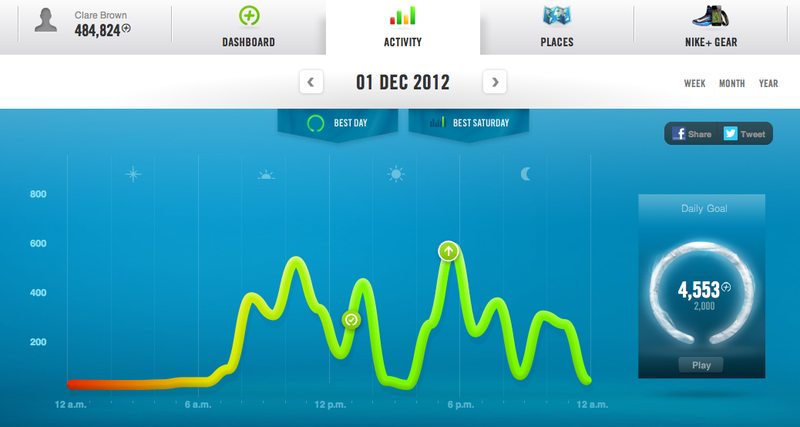 Well put quite simply, the fuelband is a wrist band you wear and it tracks your daily activity. It also looks very simple, kinda like those charity wristbands that are given out to raise awareness of terrible conditions. But this is no plain wristband this is a 'Nike' band. Press the button & this bad boy jumps into action letting you know how much 'fuel' you've earned. You set a goal for the day & the band lets you know if you are on track. I'll hand over to the nike guys for this one. Kinda like big brother, the band tracks my every movement & at the touch of a button I know if I've been on a go slow day & firmly in the red or if I'm having a killer day & smashing my goal. What information does it give you? From the band you can quickly gauge how much fuel you've earned & what time it is. Sync it with the app on your phone & you get even more detailed information like, calories burned, steps taken, & active time. Also plugging in your band to charge from the laptop gives you access to past records looking at your weekly, monthly, yearly stats! To keep you going & cheer you on you even get badges, trophies & cheers! 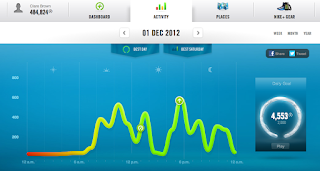 Well it works by keeping you accountable to your daily activity levels. Usually these gadgets are designed for sports people or athletes trying to improve their performance but I think the fuelband is great for say Mrs Brown who wants to lose weight & is struggling with the exercise bit. You can set goals of how much calories you want to burn, you can try improve your streak, you can look back on what your month has been like - lots of info to keep you motivated to do more activity. If you want to MAKE IT COUNT - Fuel up! Nike is racking made easy. 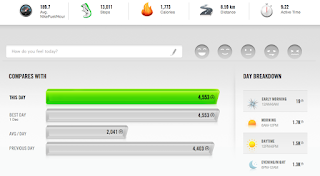 Nike makes me feel included in the sports tracking. Converting activity into fuel, kinda, makes you able to compete with athletes. 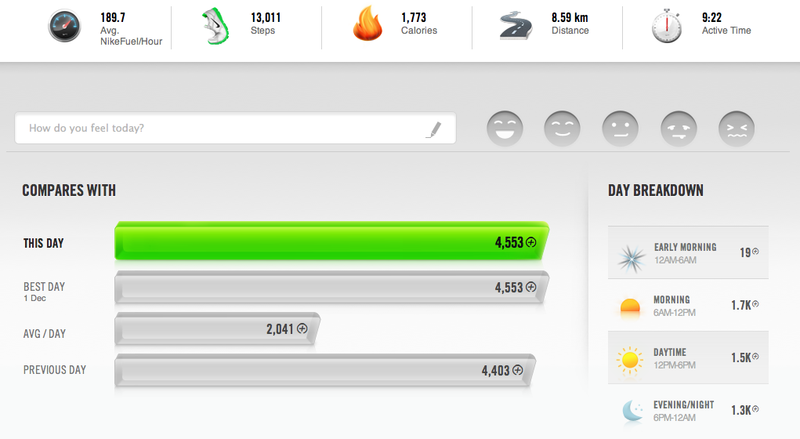 With the fuelband, unlike the trainers & watch - I don't need to be good at sports I just need to join in! Move - that's all you got to do! Anyway I can/want. This is lucky for me as I don't really shine in the sports arena. In fact it's probably why I've stuck with it. I wear it every day, & yes my enthusiasm has reduced. At the start I love getting a cheer & would be running on the spot at night just to make sure I met my goal & didn't lose my streak. Now I have stopped that but I do care if I am on target to reach my goal & it does make me think about how many 'low' fuel days I am having. So it depends what you are looking for, & it's not cheap! For me it is another useful gadget that keeps me on track. My fitness resolution this year? Well, to hit my goal more times than last year. I have also set a goal to burn 10,500 calories in 3 weeks thats 3,500 calories a week - that is the calories needed to burn off 1lb of fat each week!! Do you have any fitness goals this year? Any fitness gadgets you would recommend? Weight loss or exercise needs to be a priority if you are to make changes. It's another cool wee gadget that does help keep me going. Good luck with your goals for the new year!